O.K., I admit it. 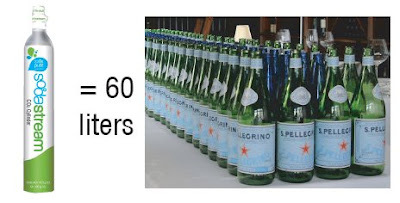 I like Italian San Pellegrino water. It's my substitute for sipping sparkling mineral water with George Clooney at his villa on Lake Cuomo. While visiting the former Soviet Union, I felt like Yuri Zhivago when I drank the "mineralni voda" - tasty mineral water from the Caucasus region in Central Asia. But, while in the Caucasus, I hardly thought it made sense to send the delicious, sparkling Central Asian water back home to NYC from Tbilisi, The Republic of Georgia. Don't get me wrong - I'm not a die hard locavore. I'm going to keep drinking foreign wine and eating cheese, fruit and other products from many countries. Not to mention buying imported products like flat screen TVs that suit my fancy. I draw my locavore line with water. Water is easy to get here as opposed to having a vineyard, a bunch of goats on a hill in Tuscany or tropical weather to grow fruit. If you want sparkling water you can make it yourself with Sodastream Fountain Jet. What's great about it is you can also make soda and infuse water with fruit essence, all without giving up quality or convenience. It's actually much more convenient considering you do not have to lug packs of bottles or cans from the store and then deal with throwing out all of the waste. Sodastream sells affordable, reusable glass carafes, BPA free plastic bottles and stainless steel bottles to put your beverage in. The gas carbonators are returnable and last for 60 litres of beverage. In addition to reducing environmentally costly production of cans and bottles, most of which end up in a landfill, you save some money. With Sodastream, sparkling water costs about 20 cents per liter, and soda costs about 20 cents per can or about 50 cents per liter. Sodastream offers several dozen soda flavors that do not use high fructose corn syrup. They also sell water essences like orange and berry to add to sparkling water. *According to the Container Recycling Institute, about 70% of soda and water bottles do NOT get recycled. Most of the waste ends up in landfills or in the ocean. 30% of plastic soft drink bottles are recycled (2003 figures). *If a couple uses the Sodastream system, they can save over 1,000 cans and bottles annually. *A family of four saves over 2,000 soda cans and bottles in a year! *It only takes 30 seconds to make your own soda and seltzer using Sodastream.